I’m very excited about some new biscuits from Doves organic. Why? 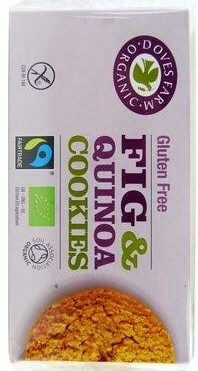 Because they’re experimenting with quinoa and figs for their biscuits and flapjacks. The result is Chocolate Chip Cookies at only 47 calories a biscuit (which lower than your average digestive!) … and it’s laced with chocolate and honey. Did I mention that quinoa is a superfood? ‘Cos it is now for me! They’ve also created some Figgy Flapjacks with whole pieces of luscious fig. Now that the warm weather’s here, how about some luscious cheese and berry pastries to enjoy at a picnic or evening soiree? These dainty little pastries are great to hand round while warm from the oven, just remember to offer tiny paper napkins for sticky fingers. Raw filo pastry dries out very quickly so keep the pastry covered until the very last minute. Unfold the sheets, take the top one off to use each time then recover the stack again. 1) Put one of the filo sheets in front of you and cut into eight rectangles, brush lightly with the melted butter then separate the pieces slightly. Add a second piece to four of the rectangles so that the second layer of pastry is at an angle to the first to make a star shape. 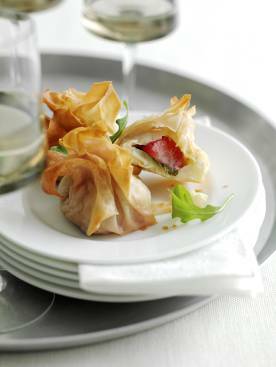 2) Add a piece of brie, a mint leaf and slice of strawberry to the centre of each then fold the edges of the pastry up and over the cheese stack, pinching just above the strawberry to make a little purse shaped parcel. Transfer to a baking sheet. 3) Repeat with the remaining sheets of pastry and filling ingredients. When all the parcels have been shaped brush the outsides with the remaining butter. 4) Bake in a preheated oven 180°C /350°F /Gas Mark 4 for about 10 minutes until the pastry is golden brown. Allow to cool for a few minutes then transfer to a serving plate; garnish with rocket leaves and extra strawberry slices if liked. When you’ve had your dinner an hour ago, but you’re still hungry. You really shouldn’t… The chocolate is calling. It’s a choice between that, some yucky leftovers in the fridge or bloating out on a bowl of unnecessary cereal. Another choice would be to grab a bar or bowl of Eat Natural’s healthy ingredients (they do both healthy cereals and cereal bars). Taking an ‘allow nothing dodgy’ approach to life, Eat Natural’s latest high fibre creations mix carbs and crunchiness with nuts, seeds and possibly fruit to give you a truly satisfying snack experience. You gotta love Eat Natural for what they do. 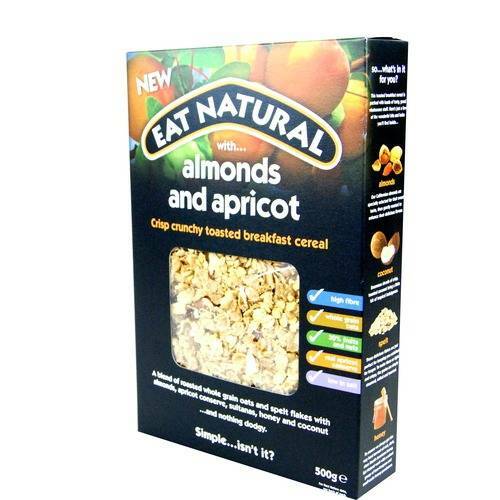 Take their Almonds and Apricot cereal for example: lots of sweetness, crunchy toasted oats and a little shredded coconut and honey. Or sample Brazils and Sultanas with its added pumpkins seeds. There’s even a crunchy fruit-free Nuts and Seeds version featuring a range of almonds, hazelnuts, linseed and sunflower seeds. The simple rule is, when you’ve gotta snack, give yourself a healthier choice. I just made a connection. Earlier this week I was writing about Trek’s new protein flapjacks. Nakd bars are enormously popular among the health conscious, with their varied range of flavours such as mocha, ginger bread and apple pie, they have a soft, chewy texture that will fill you up till your next meal. Using only raw ingredients made from a mixture of fruit and various nuts, Nakd bars also have no added sugar or syrup, and the bars are vegan, dairy free and gluten free. 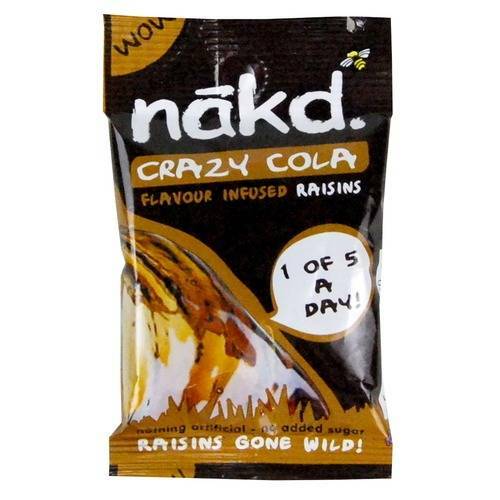 But it doesn’t stop there, Nakd also make fruit flavour infused raisins. There’s lime, pineapple, orange, lemon, cherry and erm, cola! And believe me, they’re tasty enough to make even the toughest raisin-phobe change their mind. Sports enthusiasts, Rick and James are behind the name Clearly Scrumptious and they have gone all out to bring you something special. Many people have heard about air dried sliced apple crisps, but what about air dried cranberry crisp berries sweetened only with apple juice? 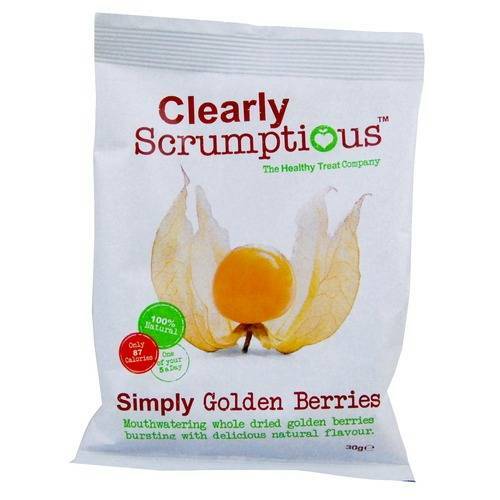 And there’s more Clearly Scrumptious have done the same with strawberries and with golden berries (aka Inca Berry, Physalis, Chinese Lanterns or Cape Gooseberries). Whatever you call them, these fruits are mouthwateringly delicious. None of these have any added sugar, colours or preservatives and best of all, no sulphites, which you may find in other brands. After all, if you’re eating fruit crisps you want them to be as natural as possible, don’t you? I was dubious at first. But where other recipes had failed, this version of the drink was a roaring success? It is reckoned that just 3g of oat beta-glucan will lower cholesterol – the key factor in heart disease. So I’ve seen several drinks companies to try mix oats into their drinks to make them healthier. In myopinion Dr Oats smoothies succeed where others have failed because their drinks aren’t gloopy, and they don’t taste like you’ve swallowed a foreign object. Instead they are made simply with fruits and oats. No added sugar, no fruit concentrate or anything else artificial. 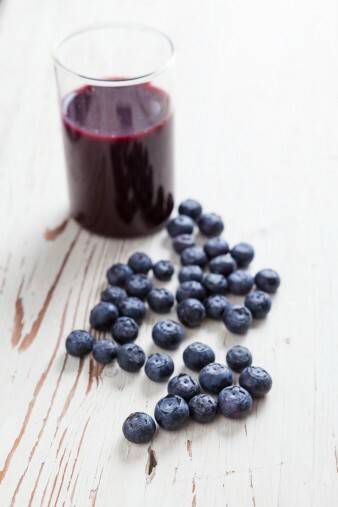 The taste is fruity and refreshing and it counts as 2 of your five a day. They boldly claim that a small drink has the same cholesterol lowering power as a bowl of porridge. Can’t be bad, especially if you don’t get on with porridge. You can try Dr Oats in 3 flavours.